White-collar Wall Street-types can certainly see the budding upside to sinking money into dispensaries, growing operations, and other cannabis related retail outlets. But those potential gains are often outweighed by the prospects of inventory control, employee management, product naiveté. And of course, the grey area that exists in all current state-level medical marijuana laws that fly in the face of Federal statute. Cue MedBox. MedBox is a publicly traded company (MDBX) that specializes in the development, sales and service of automated, biometrically-controlled dispensing systems for medicine and merchandise. They claim to currently have over 150 pieces of technology out in the field. This includes their 38 point of sale systems, and over 120 MedBox dispensing machines currently in clinics. MedBox claims to have offices and outlets across the globe and have cornered the market on medical marijuana vending machines, capitalizing on a nationwide media rush to cover the new technology, and issuing threats and lawsuits to competitors. MedBox officials sharply deny the label of “vending machine” though, insisting that their machines are placed in a secure location, attended at all hours of operation by an on-site employee unlike traditional vending machines that need no supervision. 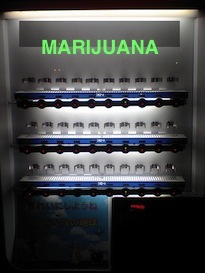 They have even gone so far as to publicly lobby against the placement of public marijuana vending machines, and claim to have denied over 100 applications submitted by investors who had no plans to monitor them and only wanted to set the machines up on street corners. MedBox founder Vincent Medizedeh drives their message home: “The stories we’ve been seeing on the news the last couple of weeks hyping the threat of pot vending machines appearing on your local street corner are exactly the type sensationalistic misrepresentations of our product that prompted us to file suit in federal court for patent infringement against the producers of a knockoff of our medicine dispensing machine, alarmingly touting “24 hour access”. Critics of MedBox seem to be growing louder by the day, voicing complaints not just about the technology itself and what it means for the medical marijuana industry, but about what they consider to be dishonest business practices being employed by the powers that be at MedBox. Their opponents say that MedBox is simply re-packaging fancy Coca-Cola machines over in Spain for a few thousand dollars, then shipping them over here to upsell to their clients for anywhere from $40,000-$50,000 per machine. But it doesn’t stop there. Through an ancillary company called KindClinics, MedBox clients are put under contract to purchase not only the overpriced soda machine, but are forced to purchase all of their dispensary equipment through KindClinics – point-of-sale systems, furniture, and in some cases even being made to sign a lease on a site location — all at inflated prices, according to our sources. In San Diego where MedBox seems to have been dumping hush-money in all directions, the total price tag is $150,000 to sign up. MedBox plans to place 30 of their machines in San Diego, and says that they have already taken deposits on 12 locations. Interesting, considering that the city of San Diego currently has a ban on all storefront dispensaries, and will not hold another ordinance hearing until the end of April to determine zoning restrictions. 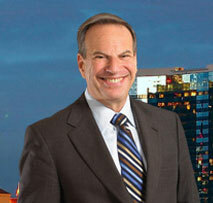 San Diego mayor Bob Filner. MedBox critics in Southern California cheered when San Diego Mayor Bob Filner’s proposed ordinance specifically prohibited the “siting and/or placement” of medical marijuana vending machines, saying that he didn’t want them to “be a distraction to getting an ordinance put in place”. That celebration was short-lived however, when MedBox released a statement on March 26th, saying that they had received clarification from the Mayor’s office, specifying that since MedBox machines are not “direct-to-consumer” they do not fall under the proposed ban. Opponents bring up legitimate concerns, such as the fact that the stated purpose of using a MedBox machine is to lower the overhead for the owner. That means fewer employees are needed, which only exacerbates the larger problem of unemployment that we face as a nation. MedBox continues to plow ahead, though, with recently publicized acquisitions of BioTrackTHC, and Vaporfection International and continues to take deposits on new site locations across the country. Appearances by scrub-wearing MedBox CEO Bruce Bedrick on mainstream media outlets like FOX News and The Huffington Post only serve to legitimize MedBox and its antiquated vending machine technology to gullible investors and naïve viewers who may not dig deeply enough to see just how destructive their influence can be for this industry. It really speaks to a larger societal issue, which is that money equals power, and power equals influence. There are real, brave entrepreneurs, growers, patients, and advocates standing on the front lines of this war to legitimize cannabis and its many benefits. Unfortunately, every war sees its share of profiteers as well.